Hello Friends, Isn’ this a perfect photo that Maria picked out for this time of year? 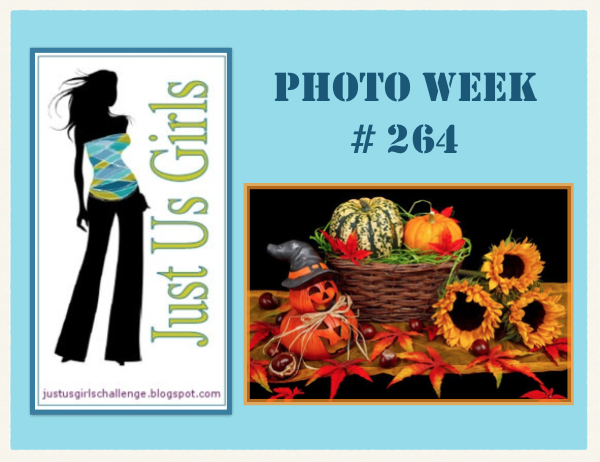 Whether you want to go with the Halloween theme, fall leaves, or the sunflowers like I did….I am sure you could whip up something and join us at Just Us Girls this week. The team did a great job with this photo too! I had to try my hand at coloring again and this time decided to use my Prisma colored pencils. Well that aren’t really mine…they belong to the resident artist in the house. LOL I chose the Sunflowers in the photo for 2 reasons and you will see why if you read on! I love this sunflower stamp that I got at a garage sale years ago. I stamped my sentiment crooked…of course I did…when I was totally happy with the flowers….. so I had to cover it up with the oval scallop. Please tell me that happens to you too! It does me ALL the time! Grrrrrr! The sentiment is from Verve…the Take Note Set. One of the Best sets I have ever purchased! 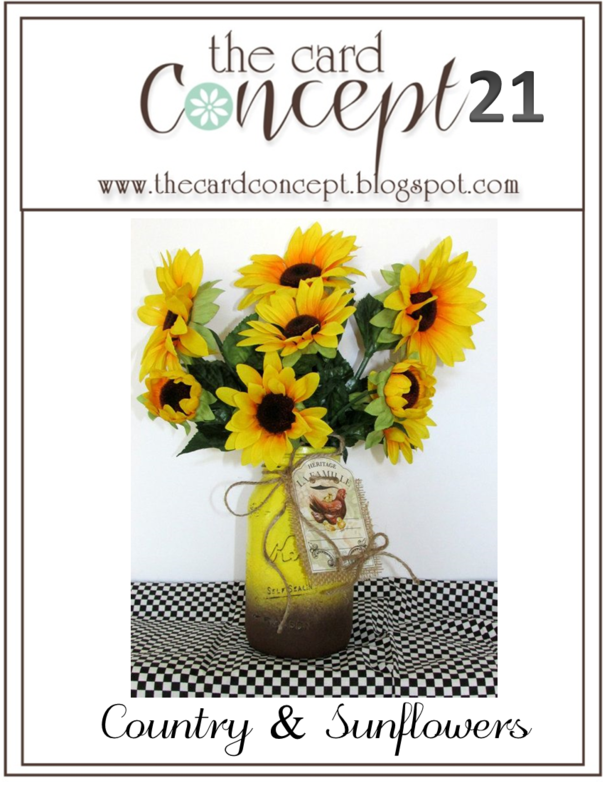 I am also linking this card up over at The Card Concept where their Inspiration photo is also Sunflowers! Love this photo!!! My Style for this card would be Clean and Simple! Love this Challenge site! This card is going to be sent to my sister as she adores Sunflowers! Alrighty then, That pretty much covers it for this post! Please come by JUGS and join us! If your chosen as our Chic of the Week your in the running as a possible Guest designer with us in the month of December! While your there, give our Guest Designer Wanda some love….she did an exceptional job this month! Thanks Wanda! Categories: Cards | Tags: Card making, Cards, rubber stamps, Verve Stamps | Permalink. Awesome card Nancy. I LOVE sunflowers and your card is so beautiful! Love your pretty sunflower card. Of course, we have stamped our sentiment crooked before and had to cover it up. 🙂 Have a great weekend, my friend. 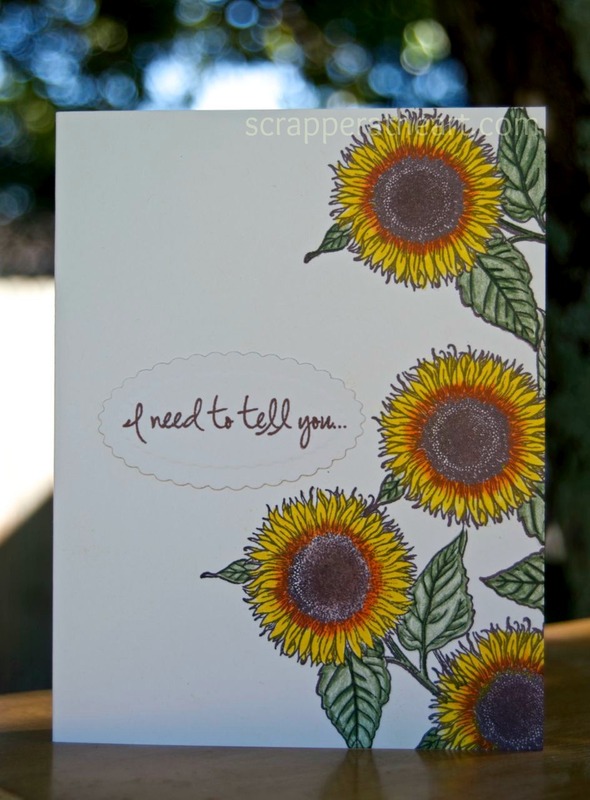 A wonderful sunflower card and I love the sentiment too. You certainly did a great coloring job. Nice to have a resident artist who has the supplies you need! Sunflowers look beautiful when you see a field of them from the air. Lucky enough my bil has taken me for a flight across them. Beautiful card, Nancy! Love those gorgeous sunflowers……colored beautifully! Nancy, I love your arrangement of sunflowers! Such a beautiful CAS design. And yes, I stamp my sentiment crooked more often than not, that way we can create another perfectly placed layer. Great image for this challenge Nancy! Love how they are just popping in from the side of the card. Your sister will love it! If you take a look at my blog, you’ll notice I love sunflowers! Very pretty card! Imperfect sentiment stamping is my speciality! Thanks for sharing your card at The Card Concept. I excel at stamping crooked! LOL! This card is gorgeous! Love how the flowers are on on edge of the card! Very pretty! So fresh, so striking and just simply beautiful, Nancy! Thank you for playing at The Card Concept this week! You did a wonderful job with the sunflowers, Nancy. And a great save on the sentiment. We’ve all done it and sometimes plan B is even better. You color beautifully! Your sunflowers have so much depth to them!